5bd/5ba ranch style with walkout basement! Vaulted ceilings, formal dining room, master on main, granite counters in kitchen with dining nook, main level laundry room, large rec room in basement with 9ft ceilings. 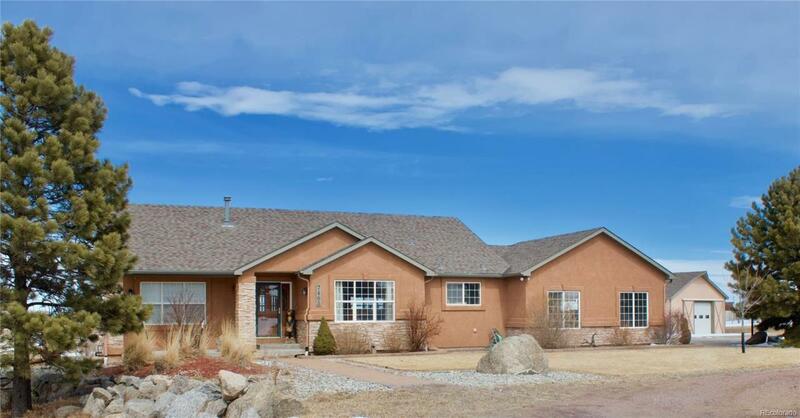 Deck off master and kitchen, view of Pikes Peak, oversized 3 car garage, 80x32 barn with concrete flooring and oversized electric garage door. Barn includes workshop, water, heated dog kennel/tack room, two 220v, and heated loft. District 38 schools, indoor/outdoor riding arena close by. Offered by Shorewood Real Estate Soco.